By now, we have established the fact that Instagram currently has a whopping 500 million users trailing closely behind Facebook and YouTube. Of course, restaurants around the world have taken comfort with the success of the social media platform. If you so happen to follow a restaurant on Instagram I think it's safe to say then you normally find yourself salvating at every savory photo. So, how do restaurants make their photos look so captivating? We have pinned down the six best practices for restaurant brands on Instagram. 1] Enticing images: This is a must-have, whether it's a photo of your signature dish or an exterior image of the restaurant. Your images need to be appealing at all times. Make sure you’re using a quality camera or phone that captures sharp colors. Don't be afraid to try different functions, styles or even apps like VSCO. 2] Use the Filters: Instagram continues to update their photo filters, which makes any image stand out. You can resize, adjust the saturation, warmth and do much more. Make the best use of it! But if you think your image might look best without the filter, go for it! 3] Use relevant hashtags: This means not only using generic hashtags such as: food or delicious. Use hashtags that are most likely to be searched. For example, (name of the dish) #ingredients #foodoftheday #picoftheday and location tags. Also, make use of trending hashtags from Twitter and Facebook if it relates to your brand. ready-to-use FREE Facebook Covers here! - Niki Pacheco, Kulture Konnect, President & CEO. 4] Behind the scenes: Share insider stories, pictures and videos of what goes on behind the scenes. This could be inside your restaurant as well as the back of the house aka inside the kitchen. Most of your Facebook audience might be following you on Instagram therefore, give them a little insider scoop that your Facebook or Twitter pages do not provide. 5] Follow relevant people: Follow your target audience based on location and interests. Believe it or not, a user near your restaurant with a low amount of followers is more valuable than someone with a large following on the other side of the globe. 6] Tell Stories: Instagram recently released "Instagram Stories" similar to SnapChat and users are making the most of it! Post images or video that you feel are share-worthy and of course meant to be shared via Instagram Stories. Have fun with it! Instagram is the perfect place for restaurants to show off their brand. The photo-video platform offers high engagement with a large target audience. 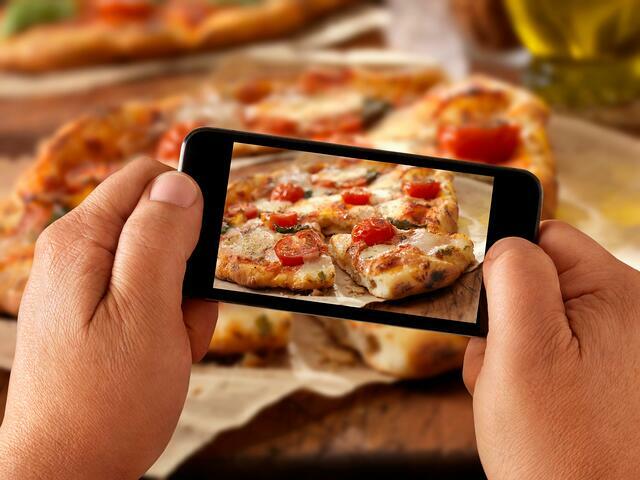 With the right photo or video, your restaurant can generate the perfect amount of exposure. Get your camera ready! And give it a try!